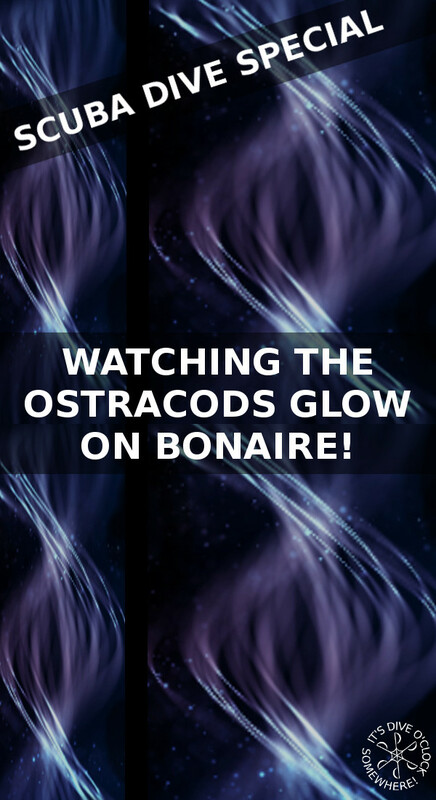 Watching the Ostracods glow on Bonaire! - Dive o'clock! A few days after full moon a phenomena happens underwater in the Caribbean Sea. This is something every SCUBA diver should experience ones in his life! Read more about Ostracods and how to organize this special dive! A few days after full moon a phenomena happens underwater in the Caribbean Sea; Underwater fireworks by tiny creatures called Ostracods! You can watch this magical show every month on Bonaire but you need to be ready to dive in complete darkness (without a dive light). It can be the most romantic dive ever but you need to plan it the right way, at the right time and at the right spot. This post will tell you exactly how to plan a Ostracod dive on Bonaire. You can read more about SCUBA diving Bonaire here: Getting THE BEST out of SCUBA DIVING BONAIRE! Scientific illustration of an Ostracod. Ostracods are tiny creatures living in fresh and salt (marine) water. They belong to the Crustacea (lobsters, shrimps and crabs) and there are Seed shrimps. They are only a few millimeters long and they swim to shallower water for mating, they glow to attract a partner. There are many creatures that can glow, especially marine life at greater depths. They glow to give a powerful signal. This phenomena is called bioluminescence. The glow is produced for signaling alarm to others, to attract a partner for mating, to distract predators or to attract bigger predators when eaten (in order to be released again) for example. Some marine creatures that produce / emit light underwater are (specific types of) octopus, jellyfish, worms, plankton and deep sea fish. Cypridinid ostracods are one of the type of Ostracods that can be found around Bonaire, the ones that produce the magnificent bioluminescence show around full moon. On land male fireflies attract mates by producing light patterns with bioluminescence, the same goes for Cypridinid ostracods underwater. Without getting too scientific there are two chemicals inside the body of those animals that produce the glow: Luciferin and luciferace. Luciferin reacts with oxygen to produce the light while luciferase (enzyme) speeds-up the process as a catalyzer. If you would like to get more scientific information about these creatures in the Caribbean click here. The magical mating show happens only a few days after full moon. Two to five days after full moon you are able to see the Ostracods with your bare eyes underwater. The best day is exactly 5 days after full moon. The glow and glitter explosion will take place after the sun has set and before the moon rises, within the minutes of complete darkness. This happens about 45 minutes after sunset if the Ostracods have NOT been disturbed by any light (dive torch, street light, lights from buildings, etc). To figure out the exact moment for the Ostracods you start with checking the full moon dates. Add five days and check the Sunset schedule Kralendijk, Bonaire for that day. Add 45 minutes to the sunset of that day (5 days after full moon). This is when the Ostracods are likely to start producing the glow. Continue reading to learn when to enter the water/start the dive and how to organize it. While you are waiting for the Ostracods to start mating you can already experience bioluminescence from another marinelife creature. If you clap your hands underwater, rub the sleeves of your wetsuit or make quick movements with your hands you might be able to see something that looks like fairy dust from Tinkerbell. This comes from much smaller (microscopic) animals, a type of plankton, called Dinoflagellates. Dinoflagellates are found around the whole world and mostly seen around the new moon phase. When waiting for the Ostracods we slowly saw more and more tiny dots lighting up in the reef, every time just a split second. After a few more minutes the dots became strings. The single Ostracods were swimming in a vertical line towards the surface while flashing and signaling the females. The line of bioluminescence was about 50 cm long sometimes and stayed visible for a few seconds up to nearly a minute! Nature can be just stunning! At a certain point there where hundreds of vertical lines popping-up all around us at about 8 meters depth. It lasted for about 20 minutes. WOW! Famous for Healthy coral reef & shore diving! Price Single tank rental about $20,- (Nitrox or Air) and about $20,- for equipment rental per day. +$25,- for a single-dive boat trip to Klein Bonaire. Discounts apply on packages. The tiny Ostracods will only display their light when it is completely dark. That is why you will have to find a dive spot that will be completely dark, without artificial light. Most centrally located dive sites (West coast) will have too much artificial light from the street, hotels, bars and restaurants. Drive either North of South. Anything from Lighthouse Point down to the Salt Pier will be great as there are no buildings or street lights close to shore. The same goes for the Northern dive sites, from Oil Slick Leap up to Karpata will be dark. If you organize your own dive and you see another car parked I suggest you to move to the next dive spot. You do not want another diver 'accidentally' turning on their dive lights before the magic happens. We went North of Kralendijk. The Lake was the first dive spot we found without waves. If you dive here make sure you enter/exit at the sand channel in between the rock/coral formations (check the dive sites book mentioned below for details). If you have a boat, anything around Klein (Little) Bonaire will be dark too as this is an uninhabited island. Quite a lot of dive centers will organize this dive for you by boat, limited space available so book in advance! This gives you an easy entree/exit in the dark, a dive guide and boat crew to help you. If you have never done a night dive or if you are a bit anxious about night diving (especially without a dive light) you should sign-up for an organized/guided trip. Make sure you arrive at the dive spot when you still have some daylight. Get comfortable and walk towards the waterfront to find the entree/exit point. Mark it with some rocks or park your car right in front when possible. Prepare your dive gear when it is still light. Make a dive plan with your buddy regarding maximum depth and dive time and stick to it. We walked in the water about 20 minutes after sunset to start our dive slowly and so our eyes could adjust to the water getting darker by the minute. We waited at about 8 meters, close to Sea fans and coral /rock formations where we thought the Ostracods might be hiding before 'showtime'. You do not need to swim, just maintain buoyancy at one spot. If you get cold easily you might want to put on another/thicker/longer wetsuit to stay warm. About 45 minutes after sunset the Ostracods started glowing! The most amazing thing I have ever seen underwater! It lasted about 20 minutes. When the show is over you can turn on your dive lights and continue with a 'normal' night dive if you like, make a safety stop and exit the water. Even though you should keep your dive lights off until you have seen the Ostracods every diver should always bring at least one dive light and use common sense regarding dive safety. In case you get really scared, lose your buddy or have another problem - TURN IT ON! If you do not have your own dive light make sure to rent one well in advance or book the trip as you will not be the only one who wants to rent one. Also bring mosquito repellent as the mosquitoes are very active before sunset. Things to do, restaurant and bar recommendations, cultural experiences and a lot of useful travel tips for your holiday! Read it here on my travel blog Crazy Dutch Abroad. 25 Awesome SCUBA Gifts for Women! Getting the Best out of SCUBA diving Bonaire! Fluorescent Night Diving on Bonaire - Must Do!